PEARL, Miss. -- Pitcher Matt Anderson took off his glove and threw it toward the visiting dugout. Outfielder Tyler O'Neill started flexing while posing for pictures on the mound. Patrick Brady and Tim Lopes emerged from the dugout with a bucket of Powerade looking for someone to drench. That's how the celebration began Thursday night at Trustmark Park for Double-A Jackson. One of the franchise's all-time best seasons culminated with a title as the Generals topped the Mississippi Braves, 11-3, to capture the Southern League championship with a three-game sweep. O'Neill was named the series MVP and went 3-for-6 with an RBI and a run scored in the crown-clinching win. "We were all fired up," the Mariners' No. 2 prospect said. "That's what it is all about, right?" In a year in which O'Neill was named the league's Most Valuable Player, Ryan Yarbough was crowned Most Outstanding Pitcher and Darren Brown was honored as Manager of the Year, it only seemed right for the Generals to take home the ultimate team trophy too. 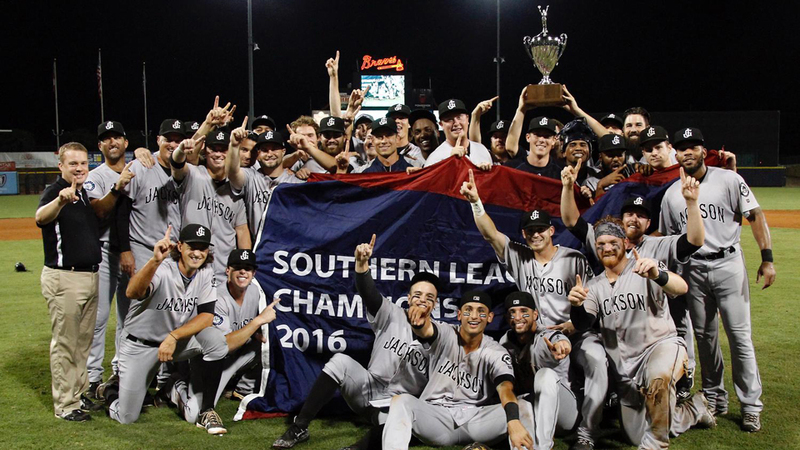 It marked Jackson's first Southern League title since 2000. "I couldn't have wrote a better script," O'Neill said. "This was a great year for us and we really wanted to show that we are the best team in this league and we did that." The Generals also clinched the first-half championship at Mississippi, so Thursday's celebration was their second this season in the Braves' visitors' locker room. "We thrive in pressure situations," O'Neill said. "Coming into the postseason, we molded and united again and the statistics show that." The rout was on from the beginning of Game 3 as the Generals, who tied a franchise record for wins with 84 this season, scored early and often. At first, however, they made the most of Mississippi pitchers' inability to throw strikes. The Braves utilized seven pitchers in the contest. Starter Patrick Weigel, the 28th-ranked Atlanta prospect, gave up four runs -- all earned -- on five walks and Dario Pizzano's double while going just two-thirds of an inning. The Braves battled back -- for a little while, at least. Johan Camargo's line-drive single scored Levi Hyams to cut the Braves' deficit to 4-1 in the second. Dustin Peterson clubbed a solo homer with one out in the third. Two batters later, Carlos Franco scored from second base to make it 4-3 when Joey Meneses' grounder took a weird hop and went over first baseman Ryan Casteel's left shoulder and into right field. From there, it was all Generals. "I thought tonight showed what we tried to do all season, in not letting up and making sure we win this game and series," Brown said. Jackson scored one run in the fourth on an RBI single by Pizzano and three more in the fifth, highlighted by Benji Gonzalez's two-run triple. O'Neill, baseball's No. 62 overall prospect, tacked on an RBI single that made it 8-3. He added a double during a three-run frame in the seventh. Paul Blackburn picked up the win after allowing three earned runs on 11 hits over six innings. He fanned two. Meanwhile, five Jackson batters recorded at least two hits in the game. "From one to nine, I feel like every batter in the lineup contributed in some way," Pizzano said. "I couldn't be prouder to be part of this team." Will Sammon is a contributor to MiLB.com. This story was not subject to the approval of the National Association of Professional Baseball Leagues or its clubs.